"I'm going to come at you with everything I've got!" Saban Films has unveiled an official trailer for an action film titled 24 Hours to Live, yet another assassin movie if you're up for another one of these. 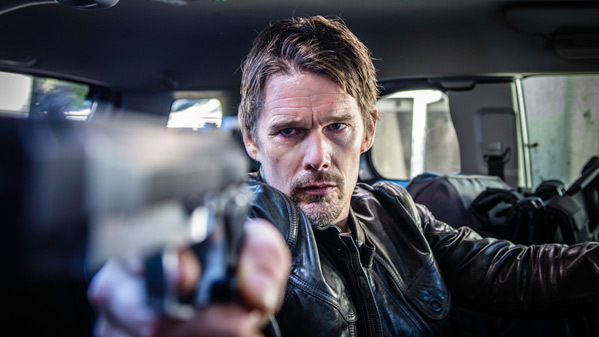 Ethan Hawke stars as a career assassin who is given a chance at redemption after his employer brings him back to life temporarily after being killed on the job. Sounds a bit like the plot to Crank, but this doesn't look similar at all. The rest of the cast includes Xu Qing, Liam Cunningham, Rutger Hauer, and Paul Anderson. I'm seriously surprised that Ethan Hawke is in a film like this, but I guess he needs some extra work to keep things going. The clock on the arm isn't an original idea, but it is kind of cool. Fire it up below. 24 Hours to Live is a fast-paced action-packed movie about a career assassin (Hawke) who is given a chance at redemption after his employer brings him back to life temporarily after being killed on the job. 24 Hours to Live is directed by filmmaker Brian Smrz, a veteran stunt man and second unit director, who also directed the film Hero Wanted previously. The screenplay is written by Zach Dean. This film will have its world premiere at the Austin Film Festival later this month. Saban Films will then release Smrz's 24 Hours to Live in select theaters + on VOD starting December 1st later this fall. Anyone interested in this?